NETWORK FINALS: There were no changes from the preliminary Tuesday numbers. CABLE HIGHLIGHTS: On USA, WWE SMACKDOWN was up 0.08 to 0.95, and it was followed by the season premiere of CHRISLEY KNOWS BEST at 0.73 (far better than SHOOTER had been doing in that slot). TBS’s THE DETOUR returned with back-to-back episodes at 0.57/0.46, considerably better than the Season 1 finale episodes at 0.41/0.34, and also above the series premiere’s 0.52/0.46. Back-to-back season finale episodes of Lifetime’s DANCE MOMS were both at 0.39, up 0.05 from last week’s single episode, and THE POP GAME premiered at 0.17. 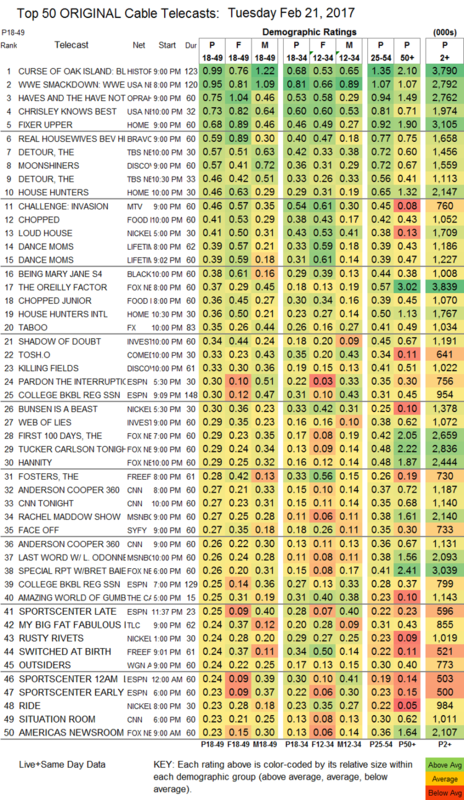 MTV’s THE CHALLENGE grew by 0.05 to 0.46, and STRANDED WITH A MILLION premiered at 0.22. The season finale of History’s CURSE OF OAK ISLAND topped Tuesday cable, up a tenth to 0.99. OWN’s THE HAVES AND HAVE NOTS gained 0.07 to 0.75. 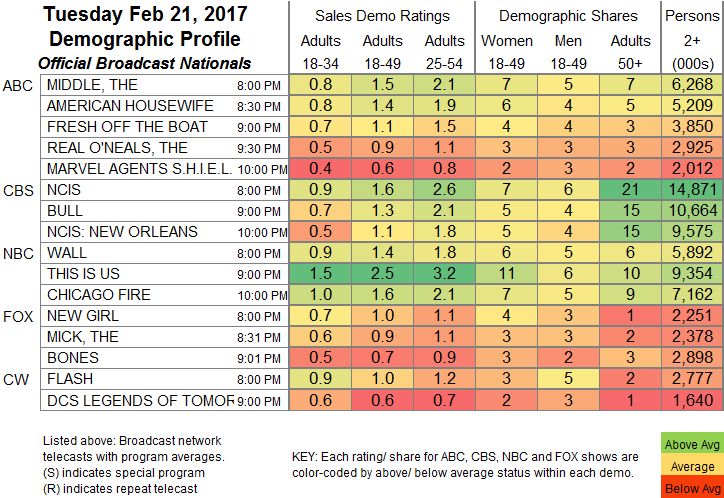 On HGTV, FIXER UPPER ticked up to 0.68, HOUSE HUNTERS was at 0.46, and HOUSE HUNTERS INTL was at 0.36. On Bravo, REAL HOUSEWIVES OF BEVERLY HILLS rose 0.03 to 0.59, and IMPOSTERS held at 0.22. Discovery’s MOONSHINERS was steady at 0.57, and KILLING FIELDS was down 0.06 to 0.33. Food Network’s CHOPPED jumped 0.12 to 0.41, and CHOPPED JR was up 0.14 to 0.36. A 5PM LOUD HOUSE on Nickelodeon was at 0.41, with lead-out BUNSEN IS A BEAST at 0.30. BET’s BEING MARY JANE slipped 0.03 to 0.38. FX’s TABOO tumbled 0.06 to 0.35. On Comedy Central, TOSH.0 fell 0.07 to 0.33, and DETROITERS was down 0.04 to 0.19. On Freeform, THE FOSTERS ticked down to 0.28, and SWITCHED AT BIRTH was up 0.04 to 0.24. Syfy’s FACE OFF grew by a tick to 0.27. TLC’s MY BIG FAT FABULOUS LIFE lost a tenth to 0.24, and TATTOO GIRLS was down 0.03 to 0.18. WGN’s OUTSIDERS was steady at 0.24. A&E’s ESCAPING POLYGAMY gained a hundredth to 0.18. On TV Land, TEACHERS ticked down to 0.14, and THROWING SHADE stayed at 0.08.